Dorm Co. Tip: Keep track of your college homework and leave notes for your roommate! This board gives you the best of both worlds! 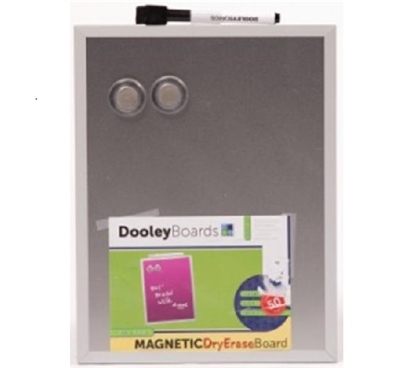 You'll have a dry-erase board for taking notes and drawing cool stuff, and you can also hang stuff from it and place magnets on it. It's a useful dorm supply for sure. When you're having to deal with all your college-life tasks, have some supplies for college that will help you stay organized. This means including dorm items like this board. You can use it to jot quick notes and be a college supply to help you be reminded of upcoming tests, papers, etc. When your dorm stuff can help make college life more practical, it's all the better. When shopping for college, it's also great to look for dorm items that can have more than one purpose. With that in mind, this board will be a useful college item for placing magnets on it. Find some cool magnets to help decorate this board and therefore decorate your dorm. You can also hang papers and other smaller items using the magnets. It's a fun supply for college that will be practical and useful. At least one board to write on should be on every student's college shopping list.